Female Dipoena melanogaster, from Spiders of the Netherlands. Contains: Steatoda, Latrodectus, Enoplognatha, Phycosoma, Robertus, Argyrodes, Theridion, Achaearanea. The Theridiidae, the cobweb spiders, are a cosmopolitan family of spiders that construct irregular webs with radiating threads. Prey is taken using a wrap-bite attack involving sticky silk (Jocqué & Dippenaar-Schoeman 2007). This family includes a number of species that live in association with humans. Notable members include Dipoena, a genus of very small spiders with an anteriorly raised carapace and a wide, concave clypeus. Characters (from Jocqué & Dippenaar-Schoeman 2007): Small to medium-sized; eight eyes present; labium not rebordered; legs with three tarsal claws, with no or few spines; tarsi IV with a row of lightly curved, serrated bristles; ecribellate; modified, aggregate silk glands present, sticky silk used to wrap prey; male palpal tibia distally widened, no paracymbium; entelegyne. [BS09] Blackledge, T. A., N. Scharff, J. A. Coddington, T. Szüts, J. W. Wenzel, C. Y. Hayashi & I. Agnarsson. 2009. Reconstructing web evolution and spider diversification in the molecular era. Proceedings of the National Academy of Sciences of the USA 106 (13): 5229–5234. [D90] Dondale, C. D. 1990. 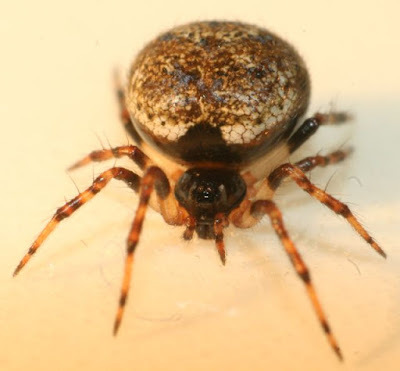 Litter Araneae (Araneida). In: Dindal, D. L. (ed.) Soil Biology Guide pp. 477–502. John Wiley & Sones: New York. [E90] Eberhard, W. G. 1990. Early stages of orb construction by Philoponella vicinia, Leucauge mariana, and Nephila clavipes (Araneae, Uloboridae and Tetragnathidae), and their phylogenetic implications. Journal of Arachnology 18: 205–234. [FS04] Fitzgerald, B. M., & P. J. Sirvid. 2004. Notes on the genus Phycosoma Cambridge, 1879, senior synonym of Trigonobothrys Simon, 1889 (Theridiidae: Araneae). Tuhinga 15: 7–12. [F64] Forster, R. R. 1964. The Araneae and Opiliones of the subantarctic islands of New Zealand. Pacific Insects Monograph 7: 58–115. [GGG04] Garb, J. E., A. González & R. G. Gillespie. 2004. The black widow spider genus Latrodectus (Araneae: Theridiidae): phylogeny, biogeography, and invasion history. Molecular Phylogenetics and Evolution 31: 1127–1142. [K02] Koponen, S. 2002. Ground-living spiders in bogs in northern Europe. Journal of Arachnology 30 (2): 262–267. [PVD10] Paquin, P., C. J. Vink & N. Dupérré. 2010. Spiders of New Zealand: annotated family key and species list. Manaaki Whenua Press: Lincoln (New Zealand). [SS02] Samu, F., & C. Szinetár. 2002. On the nature of agrobiont spiders. Journal of Arachnology 30 (2): 389–402. [S95] Simon, E. 1895. Arachnides recueillis par Mr G. Potanine en Chine et en Mongolie (1876–1879). Izviestĭia Imperatorskoi Akademĭi Nauk” [Bulletin de l’Academie Imperiale des Sciences de St. Pétersbourg], Ser. 5, 4: 331–345. [S99] Simon, E. 1899. Ergebnisse einer Reise nach dem Pacific (Schauinsland 1896–1897. Zoologische Jahrbücher, Abteilung für Systematik, Geographie un Biologie der Thiere 12 (4): 411–437. [W77] Wunderlich, J. 1977. Zur Synonymie südeuropäischer Spinnen (Arachnida: Araneida: Theridiidae, Linyphiidae, Gnaphosidae). Senckenbergiana Biologica 57 (4–6): 289–293. Last updated: 16 November 2017.